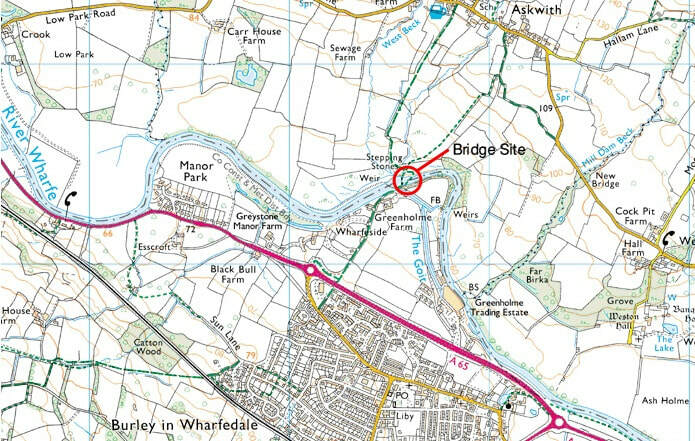 It is proposed that the new footbridge cross the River Wharfe by the stepping stones at Greenholme, Burley in Wharfedale. The grid reference is SE 166474. It s approximately 100 yards downstream from the weir on which planning approval for a footbridge has already been obtained. Image produced from the Ordnance Survey Get-a-map service.Image reproduced with kind permission of Ordnance Survey and Ordnance Survey of Northern Ireland. The bridge will be on the existing right of way and provide safe, all year, access to the footpath network north of the river. If you have Google Earth installed then you can explore the bridge location and surrounding area for yourself. Have alternative locations been considered? Alternative locations have been considered over the years, including prior to the 2014 applications for planning consent. These have included opposite Greenholme Mill (on or near the site of a long since lost bridge which enabled Askwith residents to access employment at the Mill), or close by the current proposed site. These sites have not been viable because of opposition by the north bank landowners including to the creation of new footpaths that would link to existing rights of way. The overwhelming advantage of the current site is that it replaces an existing right of way which links footpaths and bridleways on both banks and, therefore, has significant protection from the Highways Act 1980.